Thanksgiving is coming to Grace Continent! Collect Turkey Dinners and Pumpkin Pies as exclusive tokens to exchange for mounts, gorgeous outfits and tons of resources from Nov. 18th to Nov. 22nd! 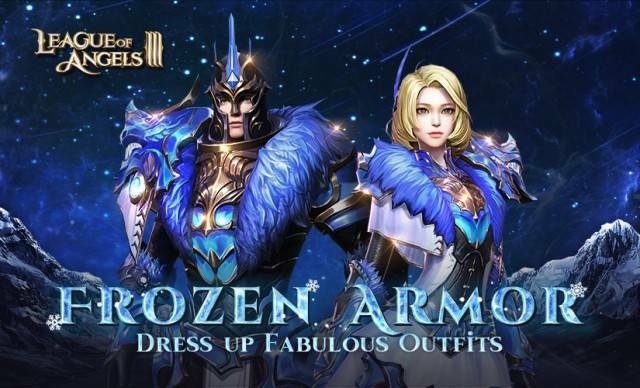 Plus, all players will be able to open different pumpkin chests that are obtained through Events and get a chance to win up to 5,000 Diamondsuntil Nov. 25th in League of Angels III! Play hard and win big! Thanksgiving card is a practical and loving way to show gratitude to your beloved ones, or even win awesome rewards.Thanksgiving Card can be obtained through Topaz Sales at an amazing discount, as well as through Events. From November 18th to November 22nd, use your Thanksgiving Card and Topaz to spin the machine and you’ll be able to win a ton of resources and exclusive tokens like Turkey Dinner and Pumpkin Pie, and even Thanksgiving Card. The 2X, 5X rewards will be come out randomly if you are lucky enough! Enjoy Turkey Dinners and Pumpkin Pie! Welcome to the League of Angels III Thanksgiving feast! From Nov. 18th to Nov. 22nd, use the Turkey Dinners and Pumpkin Pies to exchange for gorgeous outfits like Frozen Arma and Lava Arma, and tons of resources at the nearby store. 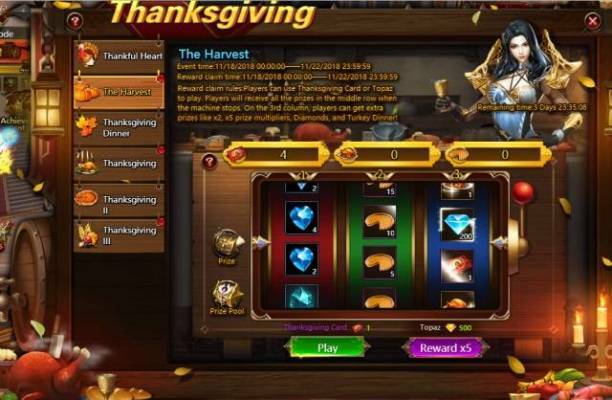 Once the outfits are permanently activated and certain requirements are met, you can also obtain Turkey Dinners besides spinning the machine. Plus, Pumpkin Pie will drop randomly from elite dungeons during Thanksgiving. Slay monsters and clear the Elite Stages! 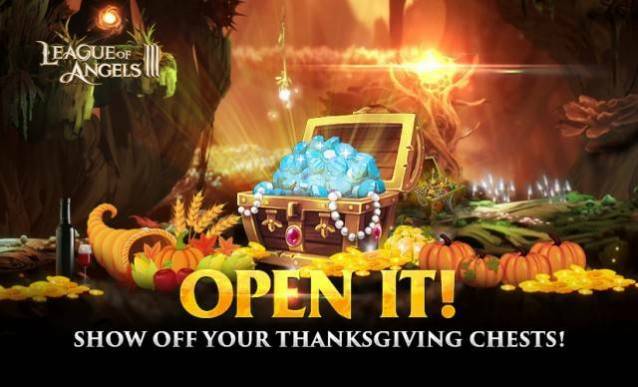 Open Thanksgiving Chests and Win up to 5,000 Diamonds! It’s time for spreading happiness! From Nov. 19th to Nov. 25th, three kinds of pumpkin chests will be available in Events where players can obtain after completing certain tasks and then open them for various resources and even Pumpkin Chests. Each pumpkin chest contains randomly two kinds of items. Take a screenshot of the resources and chests that you obtain from opening the pumpkin chests, and post it to our official forumto win UP TO 5,000 Diamonds! Don’t miss out the fun events! 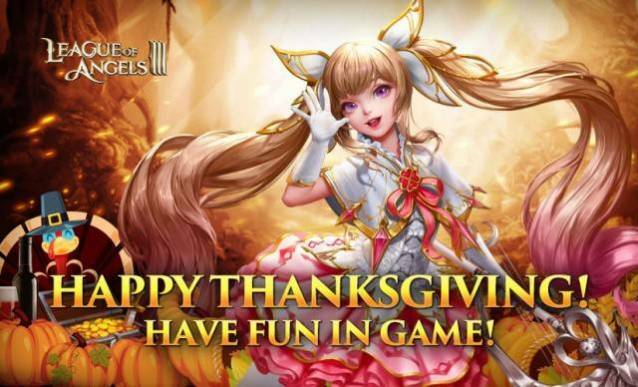 We wish all players a very happy Thanksgiving and explore more ways to play League of Angels III!